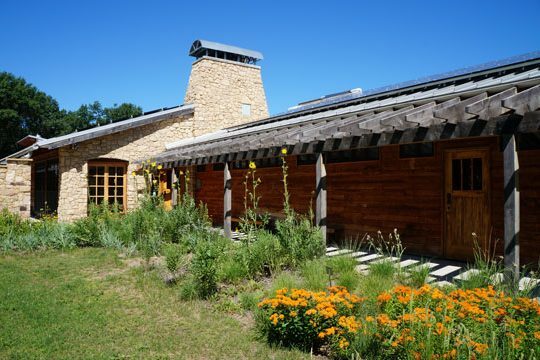 Opened to the public in 2007, the Aldo Leopold Legacy Center, or Leopold Center, serves as headquarters for the Aldo Leopold Foundation, a visitor center, and a meeting facility. Dozens of design and engineering firms, technical advisers, contractors, suppliers, artisans, and other partners worked on the building, including the chief architect, The Kubala Washatko Architects, and construction manager, Oscar J. Boldt Construction. Built to meet the highest standards in resource-efficient or “green” design and construction, the Leopold Center embodies Aldo Leopold’s concept of a land ethic: the idea that people should live on the land not only to their benefit, but to benefit the soil, water, plants, and animals that make up “the land,” as well. Following a rigorous assessment, the Leadership in Energy and Environmental Design (LEED) program awarded the Leopold Center 61 of 69 possible points in 2007, more than any other building in the United States at the time. It was also the first building to be certified as “carbon neutral” by LEED, meaning its annual operations produce no net gain in carbon dioxide emissions. And it is a net zero energy building, meeting all of its energy needs on site. In fact, despite Wisconsin’s frigid winters and hot, humid summers, the Leopold Center uses 70 percent less energy than a typical building of its size. In this way, the center not only helps us envision how we can use resources more wisely for the health of the planet, but also the many other ways we can put Leopold’s land ethic ideal into practice ourselves. There is a lot to do at the Leopold Center. Take a tour of the building, explore our exhibits and trails, see the historic Leopold Shack, or plan to hold your next meeting in one of our meeting spaces.